Tuesday we got more snow overnight. The weather started to warm up and rain on and off so some started to melt. The bonus on that was it made the snow pack-able to build a snow man. Brian planned his day again to be able to take the kids outside and play. 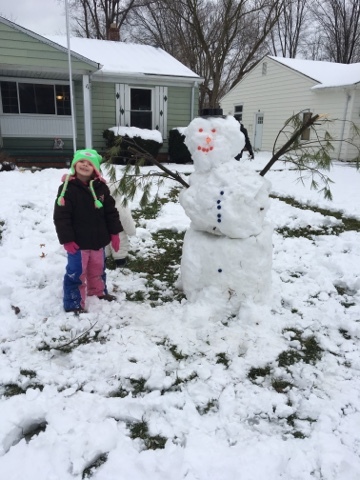 Ella got her wish of building a snowman. I can't say she really helped, atleast from what I saw. She was so happy about it and had to call and tell everyone. Can you see the excitement in her eyes. Austin originally wasn't going to go outside with them. He was going to stay inside and workout with me. He went up to the chair and looked out the window and kept yelling for his dad. He also put on my boots and tried going out the door and I told him no and he started crying. He got his way. 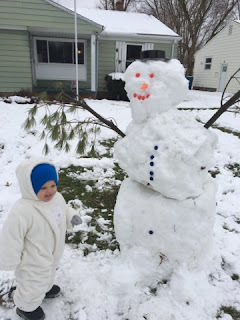 I put his snow suit on him and let him outside to play. Can you see the excitement in his face. He just liked wobbling around the yard. As Ella says "He's the Best Dad Ever" with her excitement of her snow slide. Brian surprised her and made her a snow slide to go down. I don't know if she was more excited about the snowman or the slide. Either way she was one very happy little girl.